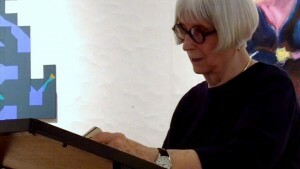 Diane Wakoski has published more than forty collections of poems, including the four books that constitute her series “The Archaeology of Movies and Books”Argonaut Rose (1998), The Emerald City of Las Vegas (1995), Jason the Sailor (1993), and Medea the Sorceress (1991)all published by Black Sparrow Press; Emerald Ice: Selected Poems 1962-1987 (1988), which won the Poetry Society of America’s William Carlos Williams Award; and The Collected Greed, Parts 1-13 (1984). She has also published four books of essays: Toward a New Poetry (1979), Variations on a Theme (1976), Creating a Personal Mythology (1975), and Form Is an Extension of Content (1972). Her honors include a Fulbright fellowship, a Michigan Arts Foundation award, and grants from the Guggenheim Foundation, the Michigan Arts Council, the National Endowment for the Arts, and the New York State Council on the Arts. This interview took place at Southern Illinois University Edwardsville on April 22,1991.It was first published in River Styx magazine #38. Philip Gounis: You’ve mentioned that the academic environment was supportive of your early work. Was there also an exchange with other poets in the Bay Area who were of the San Francisco Renaissance that was going on then? Diane Wakoski: Indirectly yes. The San Francisco Poetry Center had just been started either, a few years before, or maybe really during that time that I was an undergraduate at Berkeley.In fact it was before they had any location.They were just moving around from place to place. The program the year that I was a senior decided to invite Thom Gunn who was teaching at Berkeley to select four or five young Berkeley poets and I was one of the poets selected. I think that the big event at my reading…at least the big event in my eyes was that some of those Bay Area Poets were in the audience, like Helen Adam and in particular Jack Spicer. Jack Spicer was a very feisty character as you know,famous for doing difficult but interesting things.And I’m not sure what particular perverse agenda he was carrying out that night, but whatever it was it worked out in my favor totally, because he more or less booed all the other poets and practically gave me a standing ovation. It was the kind of thing that a young poet dreams of-being discovered. In one sense I wasn’t discovered: who was Jack Spicer? He was another ne’er do well poet on the poetry scene. But he was a figure and it was in the context of something called the San Francisco Poetry Center and it made me feel very much like I was being initiated into the aesthetics of that world and that my little school girl aesthetics were approved of. So even though Kenneth Rexroth was much around I really just knew about him and came to be interested in him much more in later years, and the same thing was true of William Everson and other San Francisco Renaissance figures. Certainly through my classes at Berkeley I was aware of the Beat Movement that was beginning to get started. My mentor at Berkeley was Tom Parkinson, so certainly I was exposed to that. But again, you know, you forget how innocent and young undergraduates are and how solipsistic and narcissistic their world is. They’re terribly aware that it’s limited but…my whole world was me.So these were little branches of connection that I began to feel when I was there. Gounis: Did your career then begin to gain momentum? After that particular reading, is that when you really felt that you wanted to go out and do more readings and publish more? Wakoski: I felt that my sense of myself as a poet was validated and so it didn’t make me more serious or intense. I already was pretty serious and intense ( laughs) , but it made me feel like it wasn’t just a self delusion. It’s one thing to be good in class, but even I with my lack of sophistication, knew that being good in class didn’t necessarily mean that you could be important in the world. So that was my first sense of moving from being good in class to going out in the real world and finding a strange, odd kind of acceptance. And then another good thing happened to me that year; Louis Simpson had come to teach at Berkeley, but I never studied with him, however he was instantly involved in the poetic world…and community. And he was a good friend of Tom Parkinson and he still had all of his East Coast connections. That year he was selecting the poets for for what came to be called The Discovery Series at the YMHA Poetry Center. I guess really through Tom’s urging -he knew that I was moving to New York City- I lived with a composer at the time, we were going to New York in the fall- so Louis Simpson arranged for me to be one of the three poets in the Discovery Program that year. So I went to New York not only with the strange little personal self confidence that I’d gotten from that San Francisco poetry reading, but the engagement to read at The New York Poetry Center. When I think of it now, in retrospect, it was probably very improper and outrageous and all based on friendships and networks; but since there was very little of that in my life anyway it served to give me a sense that something outside of me acknowledged my existence and it really was an entree for me into the New York Poetry world. Gounis: So really you were just kind of ushered into this community of poetry, but it was supportive of you and was a springboard into your other writing? Wakoski: I think that it was a springboard into the public part of my life.But Berkeley was more than just a university at the time; it really was an intellectual community.And one of the other really formative experiences for me when I was a sophomore at Berkeley was joining the staff of the literary magazine The Occident and there finding a group of friends.They were also young poets who were beginning to discover what all the possibilities of poetry were. I discovered more that way then through my writing classes,which were not bad classes -they were very good classes.But there was this instructive sense both in reading the manuscripts and seeing what was going on and comparing your own work to it and selecting them.And we spent a lot of time in hanging out in Robbie’s and The Piccolo…the cafes, there are no real bars in that area and beginning to give little open mic poetry readings or what today are called open mic readings; cafe poetry readings, we called them. And we began to discover who was good and who was terrible; and why they were good and how it all played, so to speak. It interacted with the university stuff and added to a sense of the reality of it. So in a sense..it wasn’t really the public..it was just us…those of us that wrote poetry. Wakoski: Yes, but again probably not at that stage of my life. I was very…I was still getting over my early love of Shakespeare and traditional poetry- not getting over it, but graduating from that in poetry of the twentieth century. And naturally graduating through more formal kinds of poetry. So I fell in love with Wallace Stevens and it took me much longer to come to William Carlos Williams and more avidly modernist poets. In high school I had loved T.S. Elliot. So I wasn’t really ready for Ginsberg when I was in college, but I became aware of him. I was kind of peripherally aware, you know, all the Howl trial stuff was going on, but it wasn’t a big deal and I didn’t read newspapers, so it was stuff that was just in the peripheral background.I knew that it was going on. I knew that it was important because Tom Parkinson said that it was, but I was much more interested in Edith Sitwell and Yeats. I was discovering modernist poetry on my own and really preparing myself a few years later to really be open to what Ginsberg was doing…but I wasn’t yet…and wasn’t specifically influenced by him at the time. I think that one of the poets who influenced me most when I was an undergraduate was Garcia Lorca in translation. Because one of my buddies on The Occident, Michael Rossman was laboriously translating all of Lorca’s work and sitting in The Occident office with this giant book of Spanish, reading all his translations to us.I think that I was open to that for a lot of reasons. I was studying French and French surrealism…and the poetry of Garcia Lorca was particularly an opening of a door for me because I wanted to be able to express all that lushness from my southern California background and Spanish influence, and all the music of learning to play the piano. I didn’t really find all those combinations in any English or American poetry with the possible exception of Wallace Stevens, but Stevens is such a different form…and early Stevens of course. Gounis: Did you ever get a chance to meet him or exchange any ideas with him? Gounis: You mentioned that you didn’t read newspapers and that you made a point of not reading newspapers. yet when I see Whittier, California and Orange County in your biography, the idea of politics instantly comes to mind. Did you consciously make yourself separate from any political movement? Wakoski: I think that I was unconsciously, more than anything, doing it. When I was in high school I was a speech major and the event that I was best at was something called original oratory. And the speech that got me to the state finals was a speech on McCarthyism (laughs) particularly kind of putting down Nixon. Gounis: Interesting! Another very strong point that came through yesterday during your workshop at the Saint Louis Poetry Center, and very interesting to me, was how you tied together the idea of quantum physics and the idea of poetry in creating a world of myth.You had mentioned that your husband being a photographer and working with light and light variations was an influence on your thinking. Are their any particular physicists or scientists that you exchange ideas with or that you have read that had an influence on bringing this concept into your work? Wakoski: There really aren’t. I’m sorry that I don’t have any friends in the science world, although it might be interesting to note in terms of biography that my very first writer in residence job was at Cal Tech (laughs) of all places. And at the time that I was at Cal tech, I wasn’t really able to take advantage of this because I didn’t know that my interests were going to go in that direction; but the guy in the physics world who most people think of as the poet physicist, Richard Feyman, was of course at Cal Tech and riding to his lectures on his motorcycle and giving his famous poetic lectures. Gounis: Something that ties in with the influence of the theory of quantum physics, although in a very indirect way, is the use of repetition in your poetry. It is very effective. The way that you use it, it seems that certain words or phases actually dart in and out, as light does…would you talk a little about that? Wakoski: I guess that’s one of the few musical techniques that I really do consciously employ in writing my poems, trying to create something that works like refrain, something that may work like a light motif or something that may work the way trills or decorations or cadenzas work…that move off, then come back in smaller ways. Actually I’ve played with a lot of different musical forms, but really about the only way that I know how to use them is to create some kind of pattern of repetition although metric, because I don’t use regular metrics, although I think of myself as a rhythmic speaker/writer. I don’t use end rhyme, but in a way I use words that sound like each other or actual word repetitions as ways of describing shape or seams of areas cordoned off or sectioned off or patterned off to make a pattern or partition and I think that one hears that as repetition, but it is more what you were talking about in terms of as if you see light pointing off of something. I like the idea in physics that light can be either particles or waves and I think that for me it is paradigm for the fact that many things can exist in more than one form. So, repetition of sound helps point out things that are the same but different. It’s an obvious clue to your ear that you need to look at something in conjunction to something else. Gounis: I thought too of a recent reprinted interview with Gertrude Stein where she said that,” I continue to use the word as long as I enjoy using it and as long as the reader will enjoy it. And if you enjoy it you don’t need to understand it” – in the sense that you need to translate it into your own words. Wakoski: That’s right…yeah. Stein was another one of those powerful influences on me when I was a undergraduate. I think that it was really through Stein I was able to change over from writing traditional prosody, metrical verse into writing free verse, because I heard the music in the prose of The Autobiography of Alice B. Toklas, which was the first thing of hers that I read. It was in the repeating of the sentences themselves and the repeating of words and just hearing prosy language as music. I guess that’s what I needed as a model for moving into free verse. Gounis: Are you familiar with the work of John Giorno and his use of repetition? Gounis: What are your thoughts about that kind of shamanistic repetition of phrases and words? Wakoski: It interest me. I’m not particularly interested in Giorno’s uses, which I think are very experimental and interesting, but not really where my mind goes. The poet, I think who’s been much more important to me and probably even was really doing this before Giorno maybe even Giorno was influenced by him a little bit is the poet Jerome Rothenberg. Certainly taking from his own Jewish experience, just the sound of the cantor and repetition of the incantatory service in synagogue. Rothenberg heard an early form of poetry that he liked and tried to find ways to use. Of course he’s gotten more and more interested over the years in doing that and since he’s been a friend and influence, he was my first publisher, I can’t in any way discount how important that influence has been on me. Gounis: I’d like again to touch on this idea of parallel universes and actually creating a world of mythology. I think of Castaneda’s phrase about being an “impeccable warrior” , being able to operate in two worlds simultaneously. I know that you work with the idea of touching certain mythological totems. When you create a certain universe then, that universe remains real for you off of the page too. Wakoski: I think that it does. Wakoski: The observer created universe. (laughs) Yes, yes. You get it! I think that all of these theories are just lovely and I think that anyone can participate in them. I don’t think that you need to know mathematics or even the history of physics which is interesting and productive in its own way. These ways of thinking about the nature of the world that we live in are interesting . Poets have been thinking about these things for a long time, which is why these things are called the poetry of physics. and for a long time these things had no proof, but gradually many of the theories are getting mathematical proofs. Gounis: I like the British writer Colin Wilson’s concept of the poet as a magician. I guess that one of the things that interests me, even though it’s not really possible at this time and certainly I’m not the person that can do it, but it’s a gesture that I’m making and the direction that I’m moving in: is reuniting religion, magic ( you can substitute the word poetry if you want to) and science. It seems to me that we should be able to have wholeness there. I think that we feel right now that if you understand science you have no soul; and if you understand poetry you don’t have any grasp of reality; how often there’s that separation of mind and body, or heart and mind and spirit. Gounis:…and when you think in terms of it actually remaking the world- or as Williams Carlos Williams said,”A new world is only a new mind” -then it becomes a very powerful tool. Wakoski: That’s a great quotation. Do you remember where he wrote it? Gounis: I heard Allen Ginsberg quote him in a political sense. Wakoski: I’ll have to look that particular one up; that’s a very nice one. Gounis; I think that we can close on that. Thank you so much. Wakoski: You’re welcome, my pleasure.